Configurable source and header files are copied to the project using the folder structure explained below. Libraries, source, and header files that are not configurable (and need no modification) are stored in the folders of the Software Component and get included directly from this location into the project. An Include Path to the header files of the Software Component is added to the C/C++ Compiler control string. User Code Templates can be added to any File Group and copied to any folder. Refer to Add Source Files to Project for more information. .\RTE\component class Configurable files for each component class are stored in sub-folders. The name of this sub-folder is derived from the component class name. 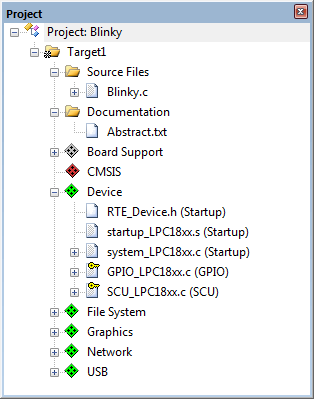 .\RTE\Device\device name Configurable files of the component class Device. For each device selected for a Project, an additional sub-folder is created and the name is derived from the device name. The folder .\RTE is created in the project root folder when using Software Components. You should not modify the content of this folder. The typical usage of the RTE_Components.h file is in header files to control the inclusion of files that are related to other components of the same Software Pack. Each component class has its own File Group. The component group and sub-group is shown in parenthesis. Icons are explained in File, Group, and Component Attributes. Open the documentation of a component. Open the Build Log file, which provides information about the build process and used Software Components.